Woman Buys Old Nintendo Game For $7.99. Turns Out It's Worth $15,000. Wilder Hamm, the owner of Save Point Video Games in Charlotte N.C., met this woman this morning when he opened his store. He held the box and saw its contents: Stadium Events. "Oh my God!" Hamm said he blurted, when she showed him the box. "She knew exactly what she had," Hamm told Kotaku. She showed it to him last, after presenting some common titles like 10-Yard Fight and The Karate Kid, before rolling out Stadium Events like a $15,000 punchline. "Normally in this business, we try not to show our cards," Hamm said. "We're not in the business of ripping people off but, you show that kind of excitement, they start expecting a mountain of money." She may get it. Stadium Events, one of the first exergaming titles, was only released in a test market in the northern United States in 1987. The next year, Nintendo bought the North American rights to its "Family Fun Fitness" mat, which then became the more well known Power Pad. Anything under the Family Fun Fitness brand was supposed to have been destroyed. The box Hamm saw most certainly wasn't. It's in great shape, and so is the game's instructions and its cart. The box still had the plastic on it, though it had been slit so that the box top could be opened and the contents verified. "She knew exactly what she had," said Hamm, who held and inspected the cart himself. "When I asked her what she expected to get, she said she expected $7,000 to $15,000, which is on target." If the plastic had not been cut—if it was truly sealed in the box—Hamm had no idea what it would be worth then. "Our price for the cartridge alone is $2,800, should we have it for any reason." 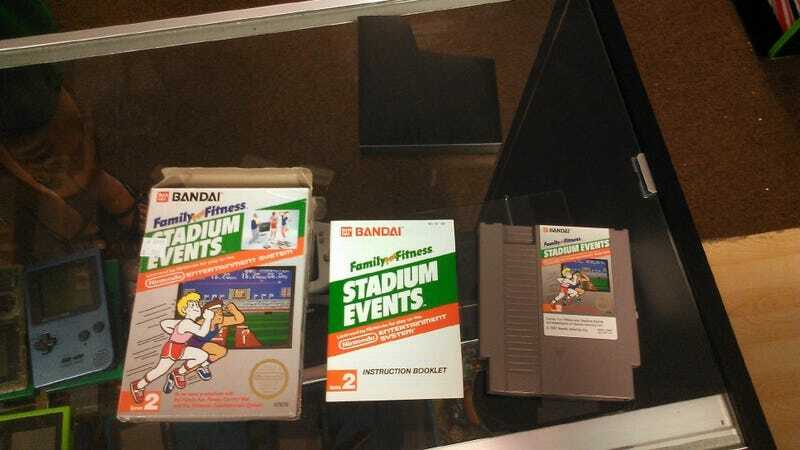 In 2010, a sealed-in-the-box copy of Stadium Events listed on eBay drew a winning bid of $41,300. The find kicked up a lot of excitement inside Save Point Video Games, but Hamm had to tell the woman his store simply did not have the money to make an appropriate bid on it. (Save Point opened in November.) He offered to sell it on consignment, which would charge a negotiable fee, somewhere between 15 and 20 percent of the sale, but the woman wanted to sell it herself and keep all of the proceeds. She said it will probably be put up on eBay within the next month. Hamm wished her well and, before she left, asked if he could take a picture of the rarest item ever to come through his door. "I felt honored just to hold it," he said. "It's given people a lot of hope," Hamm said, referring to this thread on the Nintendo Age forums. "People say that they never find anything at their Goodwill, well, the holy grail has been found there."